…..Viva La France. While Vodka isn’t my first love, but it holds a special place in my heart for its versatility. With so many unique flavored vodkas popping up daily, there’s so many flavors your can create. Here’s a tasty one featuring pear flavored vodka from our friends at Grey Goose. Don’t worry, no geese were hurt during the mixing of this cocktail. Cheers! 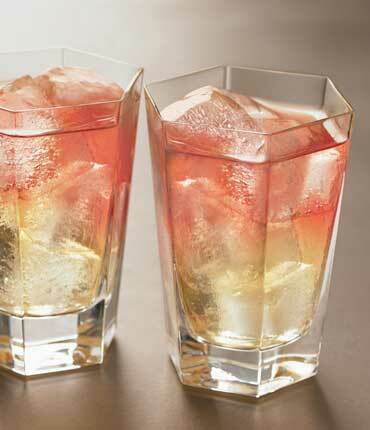 In a chilled rocks glass filled with ice, add your vodka and pineapple juice. Top with a splash of cranberry juice. Hi there – where did you buy the glasses from pictured in this post? Love them. Hi, unfortunately we did not purchase the glasses. The photo and recipe came from vodka producers, Grey Goose. I believe these are Tiffany & Co. Crystal Frank Lloyd Wright Highball Tumblers. Super expensive but absolutely gorgeous. Does Grey Goose make the Pear flavored Vodka? I have not been able to find Pear flavor…. Yes, they sure do. Its La Poire, French for pear. Smirnoff also makes pear vodka. It tastes great at half the price. These cocktails are DIVINE!! I had a hard time finding Pear vodka…but places will order it for you if you ask…I finally found 1 last bottle of Smirnoff today….tried these tonight with friends…AMAZING!! Yummy….Thanks for the recipe!